And once again, why don't we have better news today? If mankind had listened to the message that God Almighty sent by Jesus Christ, if the world believed it and followed that way, we would have good news today. But instead, we have to tell you about the good news of the world tomorrow. Because, Jesus Christ said that His kingdom was not of this world, it's of the world tomorrow. And then we are going to have good news, because all nations are going to learn the way of God — the way to peace, the way to happiness, the way to everything that we all want and desire — only we want it our way and we don't want to do the things that will produce it. We've just been going the wrong way. Now my friends, get out your Bibles and find some surprises. As we go through the Bible and see what Jesus Christ taught, what He believed, the customs that He followed, we find that they are diametrically opposite to those that are believed today. Now Jesus said that in vain do they worship Him teaching as doctrines the precepts of men. (Mark 7:7) The ideas of men — that's exactly what we have today. I tell you my friends, it's time to wake up. There is a cause for all of the unhappiness, for the empty lives, for the world chaos, for the war, for everything that we have on this earth today — there is a cause for it. There is a reason, and we can only get world peace and universal prosperity and happy filled abundant lives for all of us, when we learn the way of living that will produce that kind of lives. Jesus Christ came and proclaimed that way. They accepted Him. They accepted His name. They went out and used the prestige of His name, but they preached a different message. And they encouraged people in the ways of self and selfishness. They went out with the assumption that this is the world of God — that this is God's world — that this world is alright. That humanity is very good, they went out teaching you to have confidence in men and to believe in men. And also, just believe in Christ. And they made the kingdom of God as sort of an imaginary thing. They made the way of God a merely a fluffy fluff type of emotion or sentiment and sentimentality and they go around prating about it while they deny Him in their actions, their works, their actual beliefs. Well now, here we are in Mark the eighth chapter and the thirty-first verse. I'm using the harmony of the gospels — putting Matthew, Mark, and Luke and John altogether and this is using the American Revised translation of around the turn of the century, about 50 years ago. A revision of the old King James translation. Jesus began to teach them. This is Mark 8:31 — you might also have your Bible open to Matthew 16, because we will be coming to that in just a few minutes. Well there it is, look at it with your own eyes. Today they tell you that He was crucified on 'Good Friday.' Today they tell you that the resurrection was on Sunday morning. Now, my friends, if He was crucified on Friday, and buried Friday evening just before sunset. And it is established by Matthew and Mark and Luke and John — all four of them that the burial of Jesus, by Joseph of Arimathea was just before sunset. And the Sabbath day was coming on, and of course it would have violated the law of the Sabbath — and especially as the Jews of that time were practicing it — if they had done the work of burial after sunset that evening when the Sabbath came on. And so Joseph of Arimathea had to hasten and he had to bury the body of Jesus in his own new tomb, which was near at hand. Because, it was in very close proximity and there wasn't time to find any other place. It was an emergency proposition. So the burial was just before the end of the day when the Sabbath came on. Now, if He was killed and after three days He rose again — and if He were killed or crucified on Friday and He would rise after one day — rise again after one day — and if He had said "after one day I will rise again", after one day would have to be after. Now the resurrection could not be any nearer than, let's say a tenth of a second, after an exact, approximately twenty-four hour period. 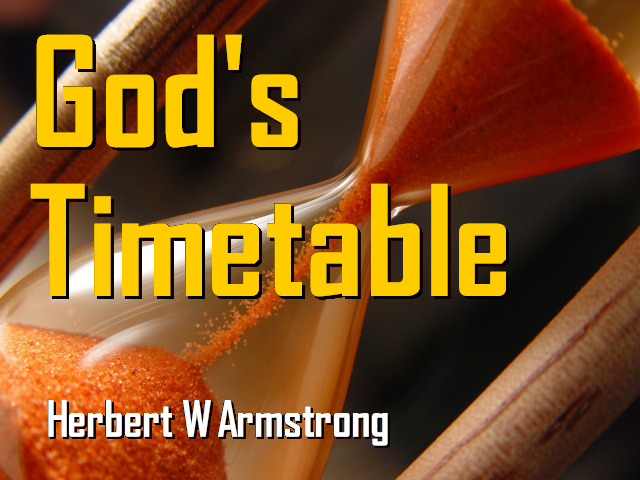 Because God does not measure days by twenty-four hours on a man-made watch. God measures days by the sunsets. And the sun does not set exactly twenty-four hours on one night from the night before, but it's very close. But it would have to be within a split second, or less after the ending of a twenty-four hour period — that is a sunset to sunset period — before it could be after one day. Otherwise it would be before one day not after. Now after is after it is all over. And there is no way that you can figure, by any process of second grade arithmetic, that the burial could have been any sooner if He had said after one day than to have been — if it was on Friday that He was crucified — to have been on Saturday evening at sunset or after. Now if He had said after two days, it would have had to have been Sunday evening — and after three days, after Monday evening. Now it could have been Tuesday, Wednesday, Thursday, it could have been any number of days after, but it could not have been a bit before. You can't get any particle of time less than three days and three nights in the expression here of Jesus Christ Himself. It seems to me that I was running across a pamphlet or a booklet or an article in some religious magazine or something, that somebody wrote trying to explain that Jesus was not three days and three nights in His grave. Now Jesus said that the only sign He would give, I think we came to that yesterday or day before on this program — and we have come to it a number of times. The Pharisees and the Sadducees, that is their religious leaders, the preachers and the priests of that day over the people, wouldn't accept Jesus as the Messiah. But a lot of the people were beginning to accept Him as the Messiah. And so they came and they said, "now Master we would see a sign from thee". They ask Him for a sign. A sign in Bible language is a supernatural proof of identity. By a miracle proving an identity. Now how would He prove He was the Messiah? Prove His identity as the very Son of God — the Messiah that had been foretold and prophesied by a miracle? Jesus said "...there shall no sign be given but the sign of the prophet Jonah. For as Jonah was three days and three nights in his grave, so shall the Son of Man be three days and three nights in the heart of the earth", (Matthew 12:39-40 paraphrased)...where He was buried. He was buried in the heart of the earth — in the rock hewn tomb right in the solid rock of the earth. Now, I think that this article, if I remember, said that the 'after three days' was expressed by some of the Pharisees and some of the uninspired men. And, let me see if I remember just where that passage is and it seems to me it's about in Matthew 26 and I will see if I can turn to it here quickly enough. Or Matthew 27 where the men had said that, after three days He would rise again. Now that's true that they did quote that Jesus had said, after three days He would rise again. Well anyway this man said well, that was just these uninspired men. We can't accept what they said, that it would be after three days. Then they tried to take the expression where in three days He would rise again. And they said, that of course in three days would be in any parts of it and therefore He was crucified on Friday and they count that day number one, and they count Saturday number two, and Sunday morning they count number three. But, you haven't got any three days and three nights. And you haven't got after three days, and my friends, here it is Jesus Himself saying after three days. And not some of these uninspired men. And they were merely quoting this, but they did quote it correctly, because Jesus said — Mark 8:31 that He should be killed and after three days rise again. Now if you take Matthew's account — Matthew said that He would be killed and the third day raise up. Now it couldn't have been after the the third day. The expression after three days, could have been four days, five days, ten days, a hundred days — that would still be after three days. And any period after, but the point I want to make is — it could not have been any closer than the exact split second of three days and three nights. It couldn't have been any less. It could have been any amount more, but it could be no less — is that plain? Now then, when Matthew recorded that Jesus said and Jesus said apparently both ways, because one writer will record one part of what He said and the other another. And He said these words. Then again in Luke. Luke records that He said that He must be killed and the third day be raised up, or be killed and the third day be raised up. Now if He was raised up the third day, it couldn't have been the fourth day or the fifth. It couldn't have been even one second into the fourth day. It had to be within the third day. But to be after three days it had to be at the very split second of the end of the third day to be after, because, A THREE DAY AND THREE NIGHT PERIOD HAD TO HAVE PASSED. And still to be within it, it had to be right on the dot. And let me tell you something, my friends, God is punctual. God does everything exactly on time. You know God causes this earth to turn on its axis exactly on time. He causes the moon to go around the earth right on time. He causes this earth to go around the sun once a year exactly on time. Now men make watches. Men invent watches and they make some very fine watches and some very fine clocks. And if you want to know the master clock in your town, go down to the Western Union. And everybody will set their clocks by that — that is most of the people in town. But that clock doesn't keep accurate time. About once a week or so they have to correct it a second or a half second. Did you know that? Now where do they go to correct it? Well I tell you, the astronomers look up into the heavens and they look at the clock that God set up there in the sun, the moon and the stars and the way they are moving. And there is a clock, my friends, that keeps exactly accurate time and it won't deviate from the course that God set it to go — it won't deviate one second in a million years. Now if there are any astronomers listening in, I will just say that most people don't understand that the earth isn't turning on its axis, an exact time by a man-made watch. It isn't prescribed, in other words, to go in an exact time, but the astronomers know just how it is to go, and as God set it to go, it goes exactly on time and the astronomers know it. Now God is on time within a second in a million years. And so if Jesus said that He would be resurrected from the grave after three days and still be in three days — that would be exactly three days and three nights. It couldn't be anymore, it couldn't be any less. Now in other places, well here He said, and the third day raise up. And in other places still He said that God would raise Him IN three days. Now in means in, inside of, not out of. That couldn't be after three days is gone. It had to be inside of three days, yet it had to be after the three days had expired and that had to be right on the split second of the end of the three days. And God measures a day by a day and a night. And in Genesis the first chapter you will find the Bible explanation of a day and a night. Jesus said He would be three days and three nights in the tomb. Now you know when it is light and you know when it is dark — and God divided the light from the darkness. And we know that the sunset is the thing that divides the light from the darkness. The light ends and the darkness comes on, after the sun sets. What do you call it. I think you call it the same thing. Everybody does — now God started us doing that. And that is one thing man hasn't changed. I wonder — say you know someone has just been slipping up. People always have to change everything God gave us, and someone forgot to change that and to call the light something else beside day. We still do it. And God started it out that way. You know, I believe that is the first thing I have ever discovered in all my life that God ever gave us, that men haven't changed. And I know someone in the hearing of my voice is going to hear that and see that we get it changed. They will probably take it up with the United Nations and get the United Nations to change it and we will have to call the light period something else besides day from now on, because God called it day and wouldn't do if we humans called the same thing that God did. You see it began with the dark period. And the day begins when the sun sets. That's in the Bible a good many places. Now an evening — which is a dark part that God called night, and a morning — a light part, which God called day — were the first day. When you are speaking of a number of days, it takes a dark part and a light part. A night and a day to be a day. Now then a little later here you find He had created, made the things that He made the very next day — and again we find the evening and the morning. That is another night part, that's two nights now. And another light part called day — that's two days — were the second day. Now how much time in the second day? Two nights and two days — now that was in verse 8. Now there's the Bible definition — how much time is consumed in what we call three days and three nights? Or how much time is consumed in what we call THE THIRD day? The three parts of darkness called night, the three parts of light called day WERE the third day. So when Jesus said that the third day He would rise, He included in that three nights and three days. And in Matthew 12:38-40 — Jesus said that the only sign that would be given, was that He would be three days and three nights in His tomb. Exactly as Jonah was three days and three nights in his grave. Now, maybe you don't understand that Jonah was in a grave and I think I've explained to you before how a young minister that was going to an ordinary Bible school. And a Bible school where they didn't study the Bible very much, but they studied books written by men about the Bible. And the ideas of men — in other words they made the law of God of no effect by having as their doctrine the precepts of men (Mark 7:7-13). I happen to know that they did do that in that particular Bible school turning out ministers for certain churches. This man came to a place where I was holding evangelistic services, a good many years ago now, when I was starting this present work. And it was in a little country school house out west of Eugene, Oregon. And this young man came out with a spirit of controversy, because this particular school — and this particular denomination that he belonged to was a very controversial type. They always wanted to argue, they wanted to chew the rag, they wanted to debate. They thought the Bible was something to debate over. They would do anything to get you into a debate. Well this young man came out and attended my meetings and so he wanted to know if he could get up and speak a word and I let him do it — when I had preached on this very subject. He said, "Well," he said, "I tell you, Mr. Armstrong," he said, "The thing you haven't learned is that in the Greek language that was a Greek idiom — three days three nights translated into the English language. And in the Greek language that actually meant just any three portions of a day or a night. Three parts — either a day or a night. You could have two nights and a day, or two days and a night and that was all it meant." "Oh," I said, "Is that so? Well," I said, "I didn't know that and I don't know it yet, but then if you think you know it, "I said, "Did Jesus say that He would be the same period of time, the same three days and three nights in His grave that Jonah would have been in his? "Well yes," he said, "He would." Well, first I asked him — I said, "Now that is a peculiar idiom that you say you learned in your school in the Greek language." He said, "Yes." I said, "of course that wouldn't be true in the Spanish language would it?" "Well no." And I said, "It wouldn't be true in the Latin or the Italian language?" "No." "It wouldn't be true in the Hebrew language?" "Well no." "Alright." now I said, "Jonah was written in the Hebrew language. Let's turn back to that." And I want you to notice that the Eternal PREPARED that fish for that purpose. And God has all power — God prepared everything and created everything. Now, "I said that was translated out of the Hebrew, that's no idioum, that means three days and three nights. And the same Hebrew language translated the three days and three nights, the definition of which I just gave you in the first chapter of Genesis." Well the young man was speechless. I guess he just hadn't progressed quite far enough in that school to know how to answer that. And the audience laughed at him and he became highly offended and stomped out — he didn't stay for the rest of the service. However the audience — well we were all out of step but him, I think the audience was out of step with me and he thought we were all wrong. But nevertheless he was so right, he had to leave the little school house there. Now every place that you find the word grave used in the Old Testament, it comes from that Hebrew word 'sheol'. So that is the word that means the grave. And hell is a mistranslation. As a matter of fact — hell is a grave. You know in England — and the King James was written in England back in the year of 1611, and in England in those days, when this Bible was written, they customarily put their potatoes in hell for the winter. A lot of people think that is funny today. Well it isn't. You know the best way to preserve potatoes and keep them is to dig a hole in the ground, put the potatoes in that hole, cover it up. Bury them there — and it is a burying place in the ground. And that is what they called hell — and that is what it meant at that time — that's why they put the word hell here, But in the meantime — we have gotten the pagan superstition and we have come to think that hell is some kind of a place. And you know I've found all kinds ideas about where hell is located. One man thought is was down in the heart of the earth, because it suppose to be a molten mass. And another man came up with a different idea. He said that heaven was inside of the sun — it's just beautiful in there and the sun, of course, is many times bigger than the earth. And there would be a lot of space, but hell was the outside of the sun, where it is burning — very, very hot. And a lot of people had a lot of different ideas about hell. But, nevertheless, the word hell, when this was written merely meant a hole in the ground and a place of burial that is covered up. So there in plain language in Jonah 2:2 — it says that he was in a grave. Now as Jonah was three days and three nights in that grave — and he was in a grave of death — if God had not caused him to be so supernaturally resurrected, as He did by having that great fish vomit him up — and a whale is no where used in the original language. That is just a misprint in the King James language, I might say. We don't know whether it was a whale or not — it was a fish that God had prepared for that purpose. And anyway, he was in that for three days and three nights — in a grave after which God supernaturally resurrected him by having that great fish vomit him up. And then he went and proclaimed God's warning to the people of Nineveh and they repented at his preaching and thereby they were saved from the disaster that had threatened them. NOW JESUS CHRIST WAS THREE DAYS AND THREE NIGHTS IN HIS GRAVE, AFTER WHICH GOD RESURRECTED HIM TO BECOME THE SAVIOR OF THE WHOLE WORLD. You see the type? Jonah was the savior of Nineveh, after being resurrected. Jesus Christ was the Savior of the world spiritually, after being resurrected from His grave! Now if you want the truth of that, write in for our booklet on 'The Resurrection.' I seem to be coming to this every few days here, but I'm just coming to it as we go through it. It's in the New Testament and the there is a great deal about it. And when there is so much about it in the New Testament, that Jesus would be raised after three days — it couldn't have been any less. Why is it that the people still think that He was crucified on a so-called 'Good Friday' and resurrected on a so-called 'Easter Sunday'? Now do you know where Easter came from? Do you know that Easter, the name Easter is the name of a pagan goddess. An ancient goddess that was worshipped. AND THE WAY THEY WORSHIPPED EASTER, THEY WENT OUT AND BOWED AT THE SUN, AT SUNRISE AS THE SUN WAS COMING UP. Bowing down before and worshipping the goddess Easter hundreds and hundreds of years before Christ. Are they still doing that today, my friends? And they call it Easter. JESUS CHRIST WAS NOT RAISED FROM the dead on any Easter Sunday. EASTER SUNDAY IS A PAGAN MYTH. IT IS A BIG LIE AND IT NEVER HAPPENED. The resurrection of Jesus Christ was not on Sunday and the crucifixion of Jesus Christ was not on Friday. Actually the crucifixion of Jesus Christ was on Wednesday. And if you want to understand how Thursday was a Sabbath day that year, write in and get that booklet on 'The Resurrection.' There is no subscription price. Now if He was raised up the third day, it couldn't have been the fourth day or the fifth. It couldn't have been even one second into the fourth day. It had to be within the third day, but to be after three days, it had to be at the very split second of the end of the third day to be after, because a three day and three night period had to have passed. And still to be within it, it had to be right on the dot. And let me tell you something, my friends, God is punctual. God does everything exactly on time. Now listen, you get pen and an envelope right now and get it quickly, so that you can write in for that right now. And I think I am going to break off right there before I go any further with this.